Hey Friends!! We have five travel sites we use quite often that we would like to share with you. If you have been following us, you have more than likely heard us mention a couple of these sites in our blog posts and in some of our YouTube videos. These sites are what we use to find travel deals, stay in the loop with the travel community, what we use to book our stay, and airfare. This is one of our favorite sites of all time when finding a suitable flight to our destinations. We use this both when we want to plan a trip somewhere and when we are just browsing for get aways. Google Flights gathers information from most airline providers, all you need to do is type in where you are flying from and where you'd like your destination to be. Then a calendar will pop up and you will be able to see when you can find the cheapest flight to your destination. When you find dates that work for you, you select them. Google will then tell you which airlines are offering those fares and how to book it. For an example sometimes it is cheaper to book two one way tickets rather than a round trip ticket or it may want you to travel with two different airlines. Google Flights will direct you in the right direction to get you to your destination for as little as possible. But sometimes they may require you to be little flexible with your travel dates to get the best deal. The CEO & founder Brian Kelly created The Points Guy by finding the best travel credit cards and redeeming the reward points to travel the world. Now he has a team contributing to their page. They are always looking for travel deals and sharing them with their followers. Although traveling using points was introduced to us by a friend. The Points Guys was one of our very first resources in finding great travel deals and how to properly redeem our reward points when booking with points earning credit cards, along with which credit cards are best for travel. They are a great resource to check regularly. We sure do!! Keep in mind they do not just post about travel deals and credit card information, they offer reviews and great travel advice. Agoda is a site that offers great hotel deals. We used Agoda for the first time on our 2016 trip to Thailand. We found a hotel for a great price on Phi Phi Island. But that was the only time we used Agoda until recently! The more we browse their site for our stay the more we are realizing how great they are. 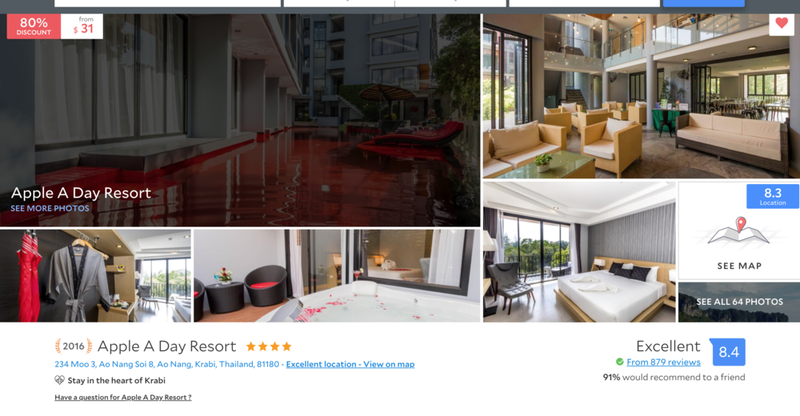 We have booked multiple hotels using Agoda for our upcoming trip to Thailand. We will be using this site more in the future. Airbnb is a web based company that connects bed and breakfast accommodations with travelers. They are our all time favorite accommodations go to. Why? You ask. Well we simply love that in most cases we have the opportunity to interact with the hosts of the Airbnb. Being able to get a recommendation on that delicious mom and pop restaurant that not many other tourist know about, or that secret view point that you could have all to yourself is a great way to experience your trip. And in my opinion there is no way better way to experience a trip than like a local. Not to mention how interesting it is to meet all of these people from all around the world and stay somewhere a little more homey than a hotel room. We have stayed in airbnb's in New York, Italy, London, Thailand, Bali and New England. Airbnb is very safe, but if safety is a concern for you please click HERE to read our related post. Hopefully it will give you some peace of mind. This one we have only used a couple times, but each time was a success. One time we used it because our layover flight from New York to Boston was cancelled. No other flights were flying to Boston that night, so we had to find some where to stay. We checked The Hotel Tonight app and found Nu Hotel in Brooklyn right next to The Brooklyn Bridge for just under $100 for the night. The second time we used it was in Chicago, we were staying in a very cute hostel but we were not feeling it. We rolled our dice and checked the app, and found a great hotel called AC Design Hotel in the heart of the city for around $70. I guess you can say we are on a winning streak with this app, or maybe they are just that good. That is all we have for now, but I am sure we will find more on our journeys and we will make sure to update you guys. There is nothing better than a reliable travel website, app or tool. See you soon Travel Bugsss.